I usually plan trips with my children to places I think they will learn something from as well as enjoy: museums, the zoo, castles, somewhere that has beautiful scenery. In recent timers, my older children have mutinied and decided they would rather stay at home than see one more old house or castle. This half term, I had hoped to go away for a few days, but the cost of everything shoots up during the children holidays and with two of them still quite small (at three and one years old), I wondered if it would be as much work as rest for me. In the end, I decided to do something I know they would want and book a trip to a theme park. 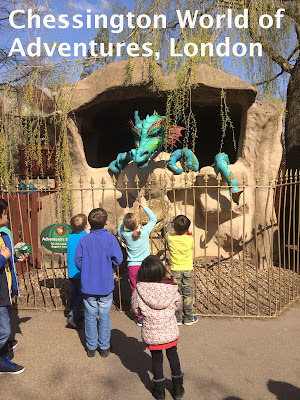 Of the major theme parks, Chessington World of Adventures is nearest to us and I get a discount through work. I booked online for the family without telling the children where we would be going, except to promise it would not be educational, much to their joy. On the morning, I packed the food from home (lamb kebab wraps, chicken mayo sandwiches and chicken nuggets and potato wedges). This is because there is no halal provision, there were vegetarian options, but my husband is particular, and often the vegetarian options are cooked with the non-veg (e.g. chips with sausages). The theme park is sign-posted from some way away, so Little Lady realised where we were going, the boys were not paying attention, so only realised when we got there. I have to say I really enjoyed their reaction and their enthusiasm. We paid online, so we didn’t have to queue for tickets, but we ended up queueing for about 15-20 minutes to collect out tickets from another queue for people who book online. I can see why because it was a Saturday during Easter break, so a busy time, but in comparison when we went to Colchester Zoo during school holidays, we could print our pre-booked tickets from a machine and go straight in with no wait. We had our bags checked in the way in, which I was happy to do and which was understandable in the wake of recent events around the world. The staff that did the checks, were very polite and not at all heavy handed about it. We started by trying to work out the best way around the park as there are a number of different themed areas. I suggested going counter clockwise in the hope we could go against the crowds, but was voted out by the kids who wanted to get to the nearest scary rides as quick as possible. Because we went at peak time, the popular rides for older children had significant queues of up to 50 or 60 minutes wait time. I can't think of a worse way to spend my time than wait in long queues for rides I am not the least bit interested in. Happily the kids didn't mind. Along the way, there are areas with animals (mainly the Trail of the Kings area and the Wanyama Village and Reserve area, but also other areas). There was a good mix of animals including lions, tigers, rhino, zebra and giraffe. There was also a reptile area, an area for birds and a sea life centre. I have to say, this was one part of the theme park I really liked and was enjoyed by the whole family. The rides were a good mix of those suitable for small children and older ones, there were quite a few that I went on with the babies and a number that Little Lady, who is a thrill seeker, went on with her dad. The rides were not really the seriously scary ones that some other theme parks have. One or two were closed on the day, including the famous Ramese's Revenge ride. There were also shows for little kids which Darling liked, which went on through the day and gave me and my husband an excuse to sit down. I struggled with the layout of the park, even with a map, I felt as if I was going round and round in circles whenever I was trying to find somewhere. This meant that by the end of the day I wasn't sure if we had missed bits of the park and we were truly, truly exhausted. I really wanted to try the Zufari ride that has been promoted quite a bit by Chessington recently, the only problem was that the queue was 50 minutes. We had to leave the pram behind and trying to hold onto Baby for that long with no pram, when all she wanted to do was make a run for it, was pretty punishing work. The Zufari ride itself was good fun and went past a good mix of animals including giraffe and a rhino, which was very cool. However for queueing for an hour, it seemed to be over in a very short time. I really liked the Sea Life centre in the theme park. It was almost as good as the main one in London, beautifully presented with a good mix of fish and sea creatures, the only thing missing were the sharks which I suppose it was not big enough to have. The toilets were plentiful and fairly clean. I found that the baby changing room had toilets that were small enough for Darling to sit on without her own seat (she gets scared on the normal loos) and a regular toilet too. This tuned out to be a good space for me to make wudhu. The park was packed out, so we found that there was not a quiet spot for us to pray, except later in the day we ended up in a wooded area between Pirates Cove and Transylvania which would have provided a quiet space to pray. Overall the kids loved it and there was enough to keep us busy all day. I felt that the queues were too long and I would recommend trying to go during an off-peak time, although towards the end of the day the queues died down a little and wait time became 5 minutes or less. Great review. We also enjoyed chessingtons last time we went and like you were not sure whether we had managed all we could see and do however we are thinking of gojng back and maybe staying for one night on resort as there are many extras but then the price comes into it aswell. Its so hard to keep kids entertained although i love reading about all the wide variety of things you have managef to do with your family. My kids are 6 and 3 and another one on the way In Shaa Allah so we dnt get to do all the castle museum parks that i would love.